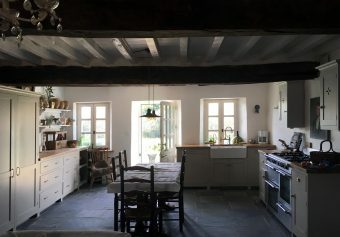 It wasn’t too long ago that it would be hard to find anything other than a white kitchen. Over time cupboards gradually started to take on darker tones until grey became king of the kitchen colours, and it’s easy to see why; it can be subtle and soft, have an industrial feel or create a wonderfully atmospheric space. In fact, its endless hues allow the colour to easily adapt to the current trend climate suggesting its reign is far from over. Recently however, there’s been a reemergence of colour in the kitchen. Pantry Blue cupboards and brass hardware, a delightful combination in the Victoria Road Kitchen. Over the past few years we’ve seen lots of beautiful dark greens and blues on the pages of our favourite interiors magazines, our Pantry Blue paint colour continues to top our customers’ wish list and everyone went a bit crazy over the enchanting deep green of our Peckham Rye Kitchen. Whether it’s softer, moody Georgian-style tones or rich, opulent colours reminiscent of the Victorian era, there’s been a real buzz around introducing, or maybe I should say bringing back, something a little less neutral to the kitchen. 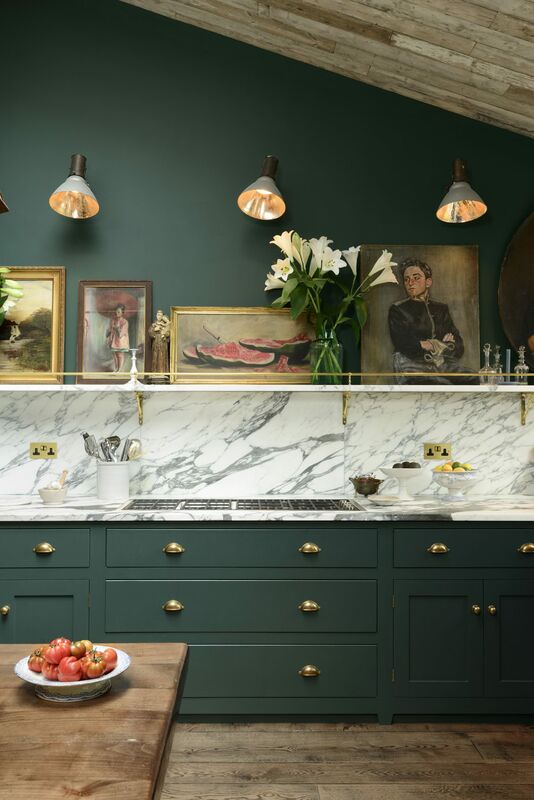 The Peckham Rye Kitchen with deep green Classic English cupboards and bold Arabescato marble. An authentic look is such a wonderful thing to achieve, especially with traditional cabinetry. It’s not about looking dated or stuck in the past, it’s about creating that timeless look that works with the style of the property. 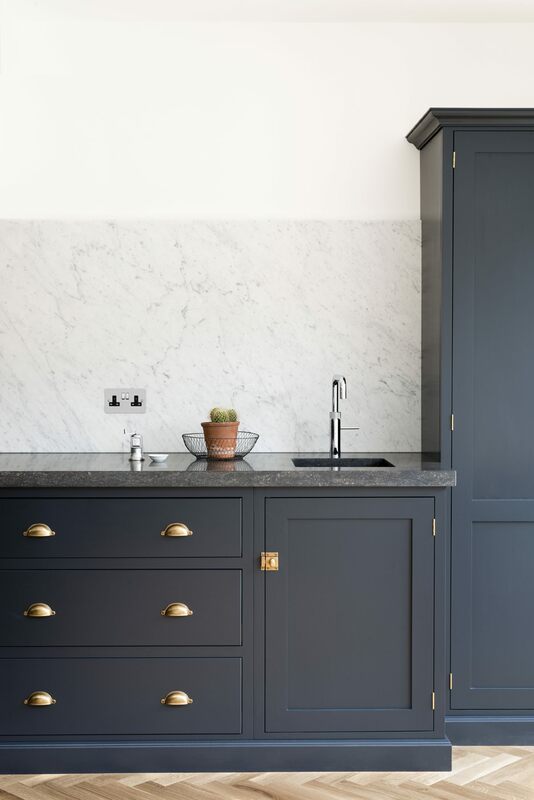 It can feel grand but not flashy, brass hardware is a good choice and worktops made from natural stones always seem to fit in a very uncontrived way. It’s interesting how much your surroundings can change the way you feel, a room with character always makes me smile, it has its own charm and just being there makes me feel good. 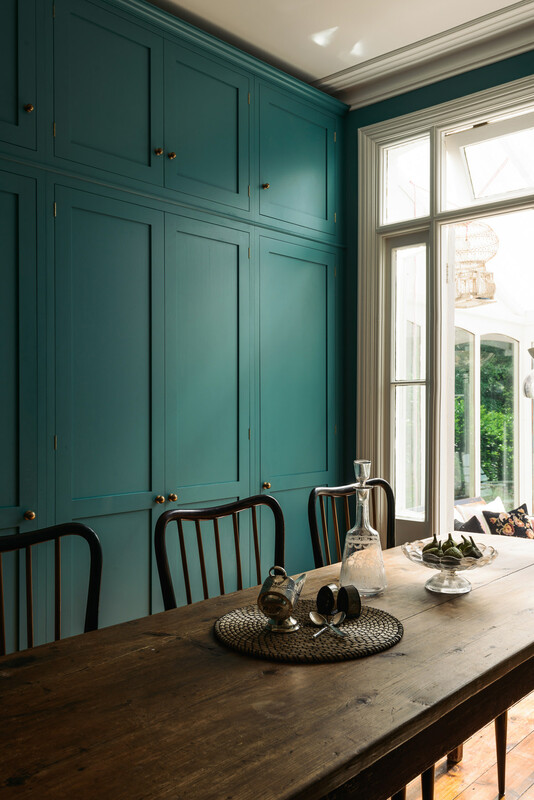 I love the new Upminster Kitchen painted in this beautiful bespoke colour somewhere between green and blue. It feels bold and playful yet somehow refined and grown up. There are no half measures here, with matching walls and cabinets, but you don’t feel overwhelmed by the colour, it’s just enough to create a very special atmosphere. A bank of bespoke cupboards paired with an antique wooden table in the Upminster Kitchen. With so many wonderful examples of colourful interiors, people seem to be getting a lot braver with their choices. We thought the pink, green and blue combination in our new London showroom may shock a few people, but we soon learned that lots of our customers were thinking about similar colour schemes. 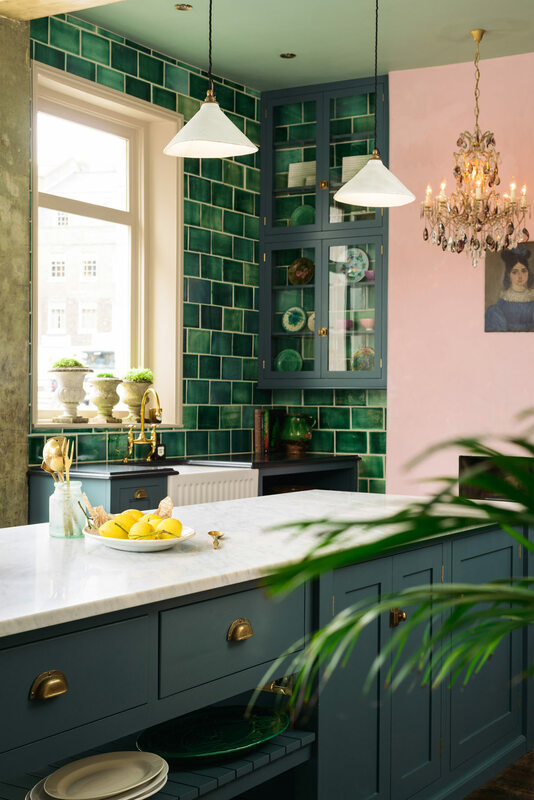 Dusky plaster pink was a popular colour towards the end of the Georgian era, but mixed with our Emerald Green London Tiles and Clerkenwell Blue cupboards, the style feels a little more eclectic and fun. 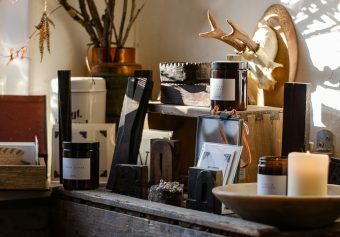 Our beautifully wonky handmade pendants and the rare vintage treasures dotted around the room all add to this look. It’s a little more ‘eccentric English’ rather than cool and moody, but it’s no less full of charm and character. 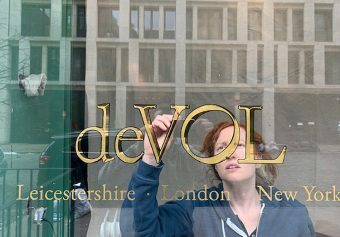 If you are ever around the Clerkenwell area, please do come and have a wander around. Like most things, it is something that you really do have to experience in person. The St. John’s Square showroom – an eclectic mix that somehow works harmoniously together. Visit our St. John’s Showroom at 36 St. John’s Square, Clerkenwell, London EC1V 4JJ. If you’re looking for more kitchen inspiration, check out our Instagram, Pinterest, Facebook and Twitter pages or you can order one of our four beautiful brochures here.